Kerry Blue came into my life already in 1979 in the form of Int Ch Lingus Sweetscent. I were 19 years old and ”Senta” became my best buddy. At that time I was studying Pharmacy in Uppsala and lived in a small apartment. We had a dog in the family when I was a child but that was a pet poodle. Now when I was going to by the first dog of my own I looked very carefully to find the breed for me. I went to dog shows to look closer on the breeds that I found interesting. For some reason I were very attracted to Kerry Blues at the shows and I am happy that I went with my intuition as Kerry Blues have become the love of my life. I had to wait half a year for my Kerry puppy. I wanted to by from the most successful breeder and she had quite a request for her puppy females. But in the middle of the winter I finally got my little girl. The interest for dog shows had already started when I was looking for breeds. As a novice I had Sentas breeder to help with grooming and handling. But already one year later I was the proud owner of another Kerry puppy. He had an outstanding pedigree and lived up to all expectations. Quite cocky as I was I thought that I now was ready to do the handling and grooming myself. 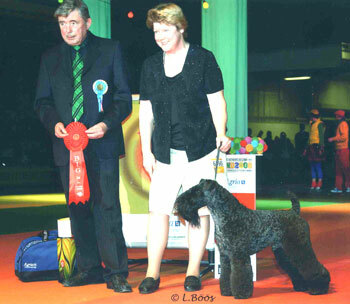 And I guess I didn’t do to bad as Int Ch Lingus Trendsetter “Cello” became Top Kerry in Sweden for three years in a row. He lived until he was 14 years old and was known for his calm and dignified way. A rare type of temperament as most dogs during these years were quite a handful. Kerry Speciality 1982, only 19 month old. In the following years I also got interested in breeding. During my years at the university in Uppsala I had only a few litters. The first was born in 1982. Senta had two litters but didn’t produce the quality I was looking for. When kennel Lingus let Cello sire a litter of one of her imported females, I took a pup in return. Int Ch Lingus In The Rough “Raffie” turned out to be everything I could wish for. All of the puppies born at Rollick’s have so far gone back on Raffie and Cello. After finishing my PhD in Pharmacy I spent a year in Philadelphia, USA. There I came to know some breeders having dogs that impressed me a lot. I bought Maygate’s Bogy Blue, a young male that I finished before he came back with me to Sweden. Here he became Top Terrier 1992. “Bogy” lived for 15 years and was a very special male. He had a great personality and his genes are spread around the world through his many offspring’s. Puppies sired by Bogy moved to Australia, USA, Russia, Ireland and many other European countries. Bogy and me in USA 1991. After Bogy came Int Ch Curragh’s Katana. I showed quite a few dogs for kennel Curragh during my year in USA. In return I got Katana who became one of my most successful dogs. 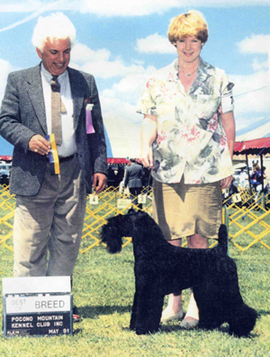 She won numerous Best in Shows. Katana teached me how a Kerry should move. After having owned a moving machine as Katana it has become my goal to breed dogs with super reach and drive combined with parallelity coming and going. Because I think that is what makes the difference between a good Kerry Blue and a great Kerry Blue. That little extra in movements. When I years later laid my eyes on a young male from Spain with just this extra quality that I love I felt that I just must have this dog. After several years of persuasion and after an exceptional carrier in Spain crowned with BOB and third place in group at the Euro Winner show in Barcelona 2004, Int & Multi Ch Opus de Chapeau Terrier finally came home to me. In 2004, Opus become No. 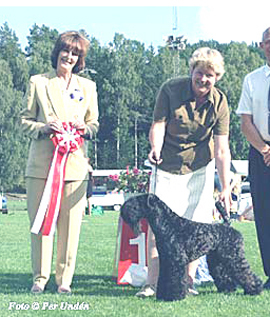 six Top Dog in Sweden shown for just half a year. I took Opus to USA where he also becomes an American champion in two weekends, getting his final points at Montgomery. Opus going BIS in Askersund 2004. Rollick’s dogs have been exported to many countries including Russia, USA, Ireland, Japan and Australia. The most successful one has been US & Can Ch Rollick’s Riverdance who was Top Kerry in USA 2006. A son of Riverdance, US Ch Symphonie’s Be My Valentine, came to me late in 2006. In his first show he won BIS and since then he has won altogether eight groups and one additional BIS. I guess I will continue to have a lot of fun with “Cruiser” during 2007 before he will return to USA. 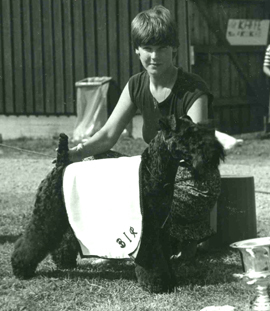 I have during many years been involved in Club activities, mostly within the Swedish Kerry Blue Terrier Club where I served as the president for nine years. I retired 2005 but in 2006 I was instead elected the new president of the Shiba club in Sweden. I have also served as treasure and president of the eastern division of the Terrier Club of Sweden.